The Minnesota Vikings defeated the Green Bay Packers at Lambeau Field, 16-0. QB Brett Hundley was 17-of-40 for 130 yards, tossing two interceptions and no touchdowns on the night. RB Jamaal Williams had 58 yards rushing, only slightly ahead of Hundley’s 48 yards on the ground. WR Stefon Diggs lead the offense, catching five passes for 60 yards and QB Case Keenum’s lone touchdown throw on the night went to Diggs. Keenum was 14-of-25 for 139 yards and the aforementioned score, and he also committed no turnovers in the game. RB Latavius Murray ran the ball 21 times for 69 yards and RB Jerick McKinnon checked in just behind him with 42 rushing yards of his own. 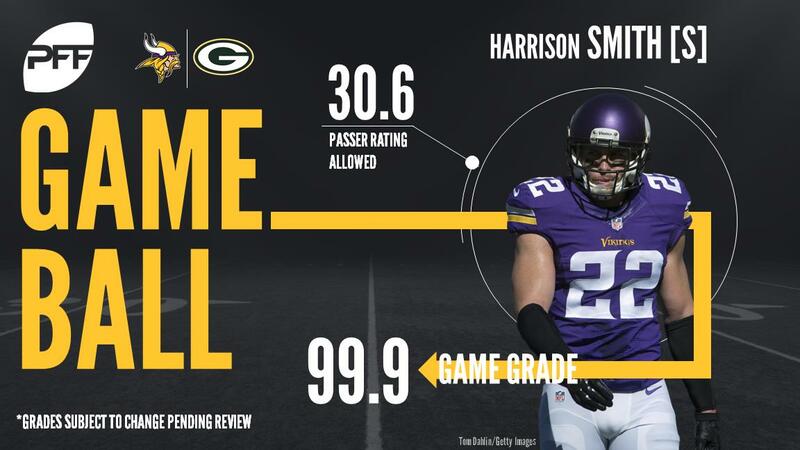 Both of Hundley’s picks were intercepted by S Harrison Smith, who made plays throughout the game. With that, we give you our PFF-exclusive takeaways from the contest for each team. With blistering-cold temperatures, the Vikings featured the run and Keenum struggled with his accuracy all game long. He only took four shots deep against a depleted Packers secondary, completing just one of those passes beyond 20 yards. Under duress on 11 of his 29 dropbacks, Keenum struggled, completing just three of eight attempts under pressure for 30 yards and taking three sacks, although he did have his lone touchdown pass under pressure. In the end, it was the Vikings ground game and their stout defense that carried Keenum to victory, as Keenum had his worst performance since Week 7 versus Baltimore. If it weren’t for a drop late in the game, Diggs would have turned truly a remarkable performance, highlighted by back shoulder catch with CB Josh Hawkins interfering on the play. Alas, the cold eventually got to the NFL’s best contested catch receiver, as he caught just one pass in the second half but still managed to record a 102.1 passer rating when targeted. Two of the past three weeks Rhodes has been at his best, being the shutdown cornerback the Vikings will need heading into the playoffs. Rhodes played well against the Packers receivers, allowing 18 yards on three catches (six targets), the longest of which went for nine yards. He forced the Packers to look to the other side of the field, as Rhodes effectively took away Jordy Nelson. Some might be expecting a lower grade for Hundley, as he only completed 42.5 percent of his passes and had a 30.2 passer rating. But he had five passes dropped tonight and had to throw three passes away. He ended with a slightly more respectable 59.5 percent adjusted completion percentage when accounting for the previous throws. While Hundley wasn’t great, he got no help from his receiver group, as they struggled to get much separation all game long. When starting right tackle Jason Spriggs went down on the first play the Packers had to play back up guard Lucas Patrick, who was playing with a club for a hand yet he was able to more than hold his own. Patrick only gave up one hurry and was also able to create room in the run game. The Packers defense certainly did enough to win the game for the home team, and the effort was led by inside linebacker Jake Ryan. He amassed nine solo tackles, including an impressive eight run stops, posting a monstrous 24.2 run-stop percentage for the week. Ryan was solid in coverage as well, yielding just a passer rating of 79.2 on two targets. This was easily the best game of the his young career, and Ryan now ranks fourth in run-stop percentage for the season. A monster stat line from a nose tackle, Clark notched two sacks, two hits, and two hurries, good for a pass-rushing productivity of 21.7. The 2016 first-rounder out of UCLA wreaked havoc on rookie center Pat Elflein for most of the night, as well as causing trouble for LG Jeremiah Sirles. Clark tacked on a run stop but didn’t make much of an impact in the run game outside of that.